Check out this cool app. 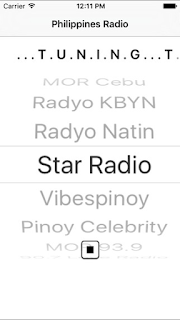 Philippines Radio App is the best way to listen to Filipino pop, rock & native music on your mobile or tablet. Search for a radio station by pressing next and previous button on playback menu and that's all you need to do. Get hooked overtime as you listen to these popular music. MOR Cebu - DYLS-FM or MOR 97.1 Lupig Sila! For Life! is a FM station owned and operated by ABS-CBN Corporation in Cebu City, Philippines. The station's studio is located at ABS-CBN Broadcasting Complex, North Road, Jagobiao, Mandaue City, and the transmitter is located at Mt. Busay, Brgy. Babag 1, Cebu City. Radyo KBYN (KaBaYaN) online radio is a product of MAIN Broadcasting Media Adlib International Network based in Singapore. Radyo KBYN (KaBaYaN) aims to serve Filipinos locally and abroad especially the Overseas Filipino Workers (OFW) through Music and Information. Radyo KBYN The First & provides the Best Filipino online music radio service! Radyo KBYN official website isradyokabayan.com Founded in 17th September, 2010. Radyo Natin (in English: Our Radio) is Manila Broadcasting Company's biggest FM radio network with more than 100 stations nationwide. For the first time in the history of Philippine broadcasting, a single radio network binds together more than 100 radio stations via satellite. With its simultaneous satellite broadcast, it provides the entire archipelago the latest news and entertainment instantaneously. 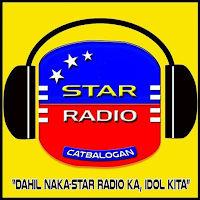 Star Radio Catbalogan is an FM radio station operating in Catbalogan City, Samar, Philippines. Its main goal is to play the best of pop, rock, opm music and to provide entertainment, news and information. Vibes Pinoy Radio is dedicated to all the people of around the world who loves to make friendship and relation through music. Vibes Pinoy Radio has created a community of their own which ensures a dedicated number of listeners for their various daily programs and presentation. Pilipino Celebrity Radio is to create high quality programming for our listeners; targeted audiences for our advertisers; and to attract, Celebrities listeners develop and sustainable and efficient and highly productive group of broadcast professionals. MOR (My Only Radio) Legazpi is the FM radio station of ABS-CBN Corporation in Legazpi City, Albay Philippines. For the past years, MOR 93.9 Legazpi has retained the top spot, as evidenced by surveys conducted by credible information and measurement companies such as Nielsen and Kantar Media. Playing the hit contemporary, OPM, and pop music, while providing relevant news and updates in the community, MOR Legazpi continues to carry out ABS-CBN’s famous slogan, to be of service to the Filipino people, as it extends its programming worldwide through online streaming. MOR 93.9 Legazpi is a KBP Golden Dove Awardee as People’s Choice for Best FM Station in 2010, Regional Category. Sa loob ng halos apat na dekadang pagsasa-himpapawid sa radyo ng 90.7 Love Radio sa FM band, hindi na lamang basta-basta kinilala ang istasyon bilang isang simpleng himpilan ng radyo, kung hindi maging isang impluwensiya na sa masang Pilipino. Nag-simula noong 1946 sa AM band sa call sign nitong DZMB, itinatag ito bilang kauna-unahang music station sa Pilipinas. Lumipat sa FM band ang DZMB noong 1975 na siyang naging hudyat ng pag-sibol ng Love Radio network sa Luzon, Visayas at Mindanao. Naunang napakinggan sa 90.7 Love Radio ang mainstream pop, na ‘di kalauna’y naging easy listening music. Hanggang sa ngayon, hindi mapapantayan ang kalidad ng mga palatuntunang ibinabahagi ng istasyon mula sa DJs hanggang sa music format na middle-of-the-road songs, contemporary hit tunes at mga ‘di matatawarang alternative at modern rock hits. Sumasahimpapawid sa 25,000 watts, inaabot ng isa sa nangungunang radio stations ng Manila Broadcasting Company ang mga tagapakinig ng radyo mula Metro Manila at piling bahagi ng Quezon, Nueva Ecija, Bataan, Zambales, Rizal Province, Bulacan, Laguna, Cavite, Batangas, Pampanga, Tarlac at Pangasinan. Pagpasok ng taong 2000, hindi na nagpaawat ang 90.7 Love Radio at patuloy na naging patok sa pandinig ng masang Pilipino. Ang taglines nitong “Kailangan Pa Bang I-Memorize Yan?” at “Bisyo Na ‘To!” ay naging pang-araw-araw na bahagi na ng pakikipagtalastasan ng masang Pinoy. Noong 2003, kinilala na nga ang 90.7 Love Radio bilang #1 FM radio station ng radio research firms at survey entities.